The Child Welfare Information Gateway describes Child Abuse as, “Any recent act or failure to act on the part of a parent or caretaker which results in death, serious physical or emotional harm, sexual abuse or exploitation; or an act or failure to act which presents an imminent risk of serious harm.” Child Abuse is categorized as follows: physical, emotional, sexual and neglect. Physical abuse is non-accidental physical injury as a result of beating, hitting, slapping, biting, etc. Physical discipline, such as spanking or paddling, is not considered abuse as long as it is reasonable and causes no bodily injury to the child. Neglect is the failure of a parent, guardian, or other caregiver to provide for a child’s basic needs. Examples are failure to provide basic necessities such as food, clothing, basic medical care, egregious lack of age-appropriate supervision (i.e. leaving an infant unattended in a car). Emotional abuse is a pattern of behavior that impairs a child’s emotional development or sense of self-worth. Examples are telling a child her or she is worthless, threatening, withholding love and affection. While the physical wounds heal, there are several long-term consequences of experiencing the trauma of abuse or neglect. Abused children often are at risk of experiencing cognitive delays and emotional difficulties, among other issues. Childhood trauma also negatively affects nervous system and immune system development, putting children who have been maltreated at a higher risk for health problems as adults. How can I help if I don’t suspect child abuse, but see a stressed out parent with a child? Child Help states, “We believe the key to preventing child abuse is education and awareness.” A stressed out parent with a small child might benefit from a word of encouragement or offer of assistance. A word of understanding to a parent with a child in the middle of a tantrum can make a big difference. If the stressed out parent is a friend, neighbor or other acquaintance, offer assistance with a few hours of child care or household chores. Share community resources, such as parenting classes, stress and anger management. For military families, call us for advice. Can I leave my children home alone? Children ages 0 years to 4th grade must have Direct Supervision at all times. 5th and 6th grade children must have Monitored Care for no more than two consecutive hours. 7th and 8th graders may be under Self Care for no more than four consecutive hours. 9th and 10th graders may be under Self Care for no more than six consecutive hours. 11th and 12th graders may be under Self Care for no more than ten consecutive hours. Youth Baby-sitter: A child in grades 7-12 may provide direct supervision for non-siblings if they have completed the American Red Cross (ARC) Baby-sitter certification class or equivalent. Although strongly encouraged, a child in grades 7-12 need not have completed the ARC Baby-sitter certification class or equivalent to care for a sibling. A child in grades 7 or 8 will provide direct supervision for no more than four consecutive hours per day. 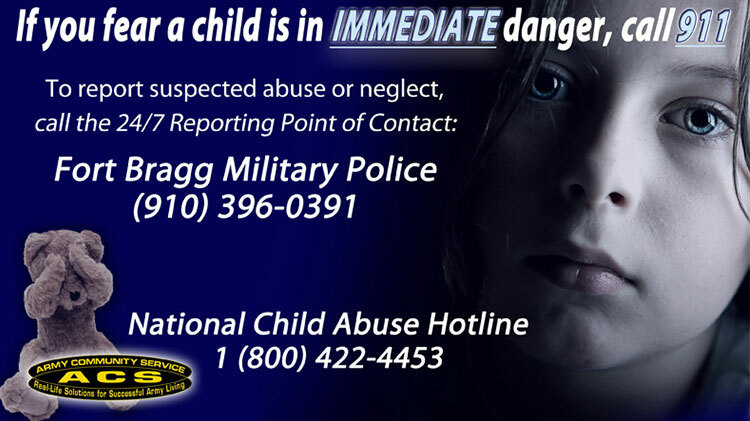 See the Fort Bragg Home Alone policy (.pdf) for more information. I need help! What is available? Good news! The Fort Bragg Family Advocacy Program (FAP) offers a number of excellent resources to assist families with the complexities of raising children. For expecting families and children up to 36 months, the New Parent Support Program (NPSP) offers free in-home visits to answer any questions you may have about childbirth and caring for infants and toddlers. In addition to free in-home visits, NPSP offers a variety of classes, including Infant Massage, Baby Basic Training, Play Mornings, Baby Sign and more. FAP offers a variety of parenting classes, such as 123 Magic, ScreamFree, Active Parenting and Parenting 1-4. FAP also offers Parenting for Children of Divorce and Custody, Active Parenting for Step Families, Couples Communication. More good news! Not only does FAP offer free limited childcare, soldiers can now receive promotion points for completing some of the FAP classes. If you have any questions about parenting issues or family problems, the Child Advocate trainers are available for non-therapeutic advice, consultation and referrals.